Rite Aid (RAD) told CNNMoney it would sell Epidiolex once the DEA schedules it. "Rite Aid pharmacists fill prescriptions in accordance with all state regulations and laws as well as those set forth by the DEA and FDA," said Rite Aid spokeswoman Ashley Flower. 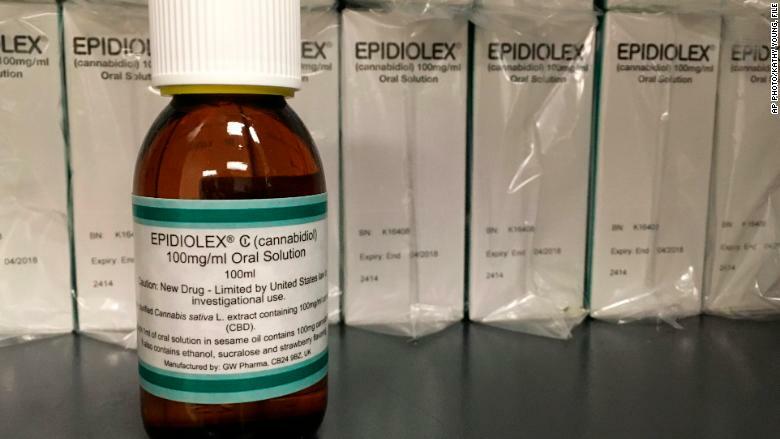 "Given that Epidiolex has received approval from the FDA, upon being rescheduled, Rite Aid expects to fill prescriptions for Epidiolex later this year based on availability." Walgreens (WBA), CVS (CVS) and Walmart (WMT)did not immediately comment about their plans to fill Epidiolex prescriptions. "If it's possible to stock it and dispense it, we will do it," said Phil Kuhr, manager and pharmacist at Stoner Drug, a pharmacy in Hamburg, Iowa, that's been in business since 1896. CBD is different from marijuana's more well-known compound: tetrahydrocannabinol, or THC, which gets people high. Marijuana is considered a schedule 1 drug by the US government, putting it on par with heroin. It is a federal crime to buy and sell marijuana, although 10 states have legalized its recreational use. DEA spokesman Melvin Patterson said the agency has no plans to reschedule or deschedule marijuana, though there is a "discussion" about rescheduling CBD. But he said that won't affect Epidiolex's approval, since individual drugs often receive their own schedule. But dispensaries won't be selling Epidiolex or any future FDA-approved drug with CBD, according to Kris Krane, president and co-founder of 4Front, an advisory and investment firm that owns dispensaries.